The Cup of Tae Festival Committee has just announced that the famous Donegal fiddler Martin McGinley will be honoured at the 2017 Cup of Tae festival, which will take place here in Ardara from April 28th to May 1st 2017 ( May bank holiday weekend). Martin has been a constant at every Cup of Tae Festival since the beginning and is a popular choice to be honoured. Martin, son of the famous Raphoe fiddler Kathleen McGinley, is highly respected in the world of music, in recent times with the Donegal Youth Orchestra, and there are few gatherings of fiddlers where you won’t see Martin. His contribution to traditional music and indeed the cultural and community life of Donegal is immense. 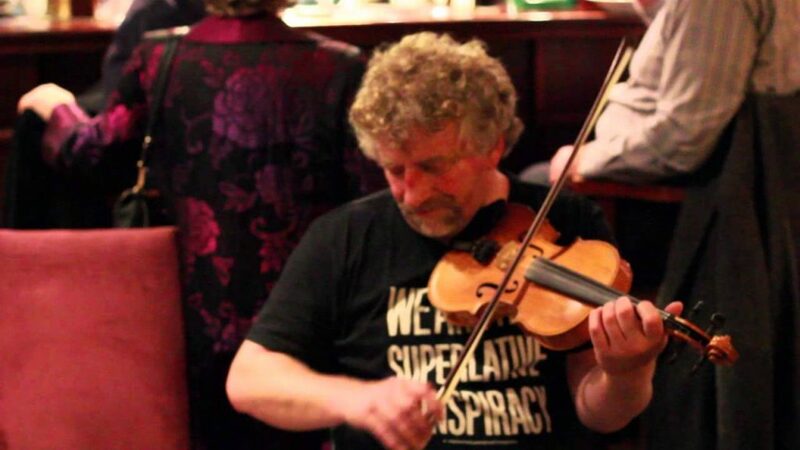 Martin McGinley is one of Donegal’s best-known fiddlers. He has played in concerts and at festivals in Ireland, Britain, around mainland Europe and in the US and Canada. He has also frequently performed on television and radio. He presented a series of the RTE tv show ‘The Pure Drop’ and programmes on traditional music on RTE Radio 1 and BBC Radio 3. Originally from Raphoe in east Donegal. Martin gives weekly classes in Mulroy Music in Milford, as well as teaching annually at the Donegal Fiddlers’ Week in Glencolumbcille and the Fiddlers’ Farm weekend in Nieuwe Niedorp north of Amsterdam. He has the honours teaching certificate from Comhaltas Ceoltoiri Eireann. He has adjudicated fiddle and banjo at provincial and All-Ireland level. As well as having an extensive repertoire which includes Irish, Scottish, Cape Breton and old-time material, Martin has also a collection of original tunes, such as ‘The Raphoe Reel’, recorded on Dervish’s first album, and ‘The Bunglass Lass’, heard now in sessions in Donegal and further afield. He has also dabbled in other genres, including bluegrass and blues. He is studying for a Master’s degree in music with the Open University. Beginners School of Music in Fidil, Feadóg Mór, Giotáir, Feadóg Stáin, Bosca Ceoil. The world famous Ciaran Ó Maonaigh is our masterclass fiddle tutor this year. A special event to honour one of Donegal’s most famous and popular Musicians, fiddle player Martin Mc Ginley. Martin is one of the foremost musicians in Ireland and presently leads the Donegal Youth Orchestra. This is a unique event as a special group of young musicians from Co. Cavan called Caioramh will put on a performance. They will be joined by special guest Martin Mc Ginley and local fiddle maker and top musician Michael O’Rourke. A free event – Not to be missed. Open air musical recitals with Pipe Band and traditional musicians and visiting guests. Amongst the many guests this year are a group of musicians from Columbia and also a group of traditional players from New York who plan to attend. James Keeney will present an evening of story, song & dance with recitations and craic to particularly acknowledge the late Packie Manus Byrne. Friends of Packie Manus will visit this year from the English circuit. An evening with Ciaran Ó Maonaigh. An evening of sessions and stories with many of the visiting musicians joining Ciaran at this very special event. Open air musical recital which will include the students and teachers from the schools and workshops will display the learning that took place with a session on the Diamond. This year a list of top musicians will perform at this concert in honour of the late great John “the tae”. Free Irish Music Sessions in all Pubs in Town (see Posters).